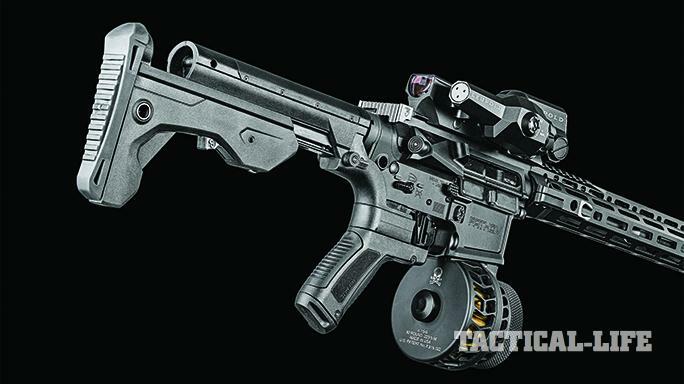 Want to experience near-full-auto speed and fun without the Class 3 hassle? 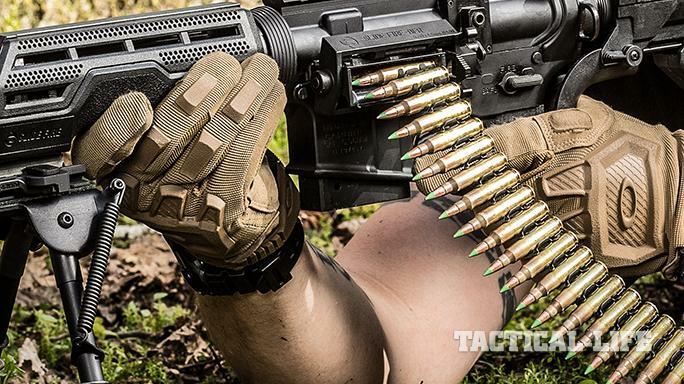 Meet the Slide Fire system. 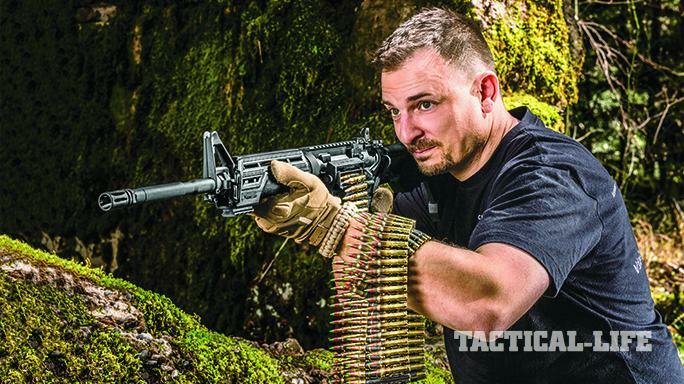 After serving in the military, Jeremiah Cottle returned home and decided to tinker with affordable bump-fire methods. 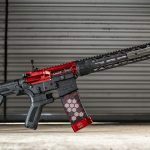 After years of testing and refinements, Slide Fire Solutions is now an AR accessories powerhouse. 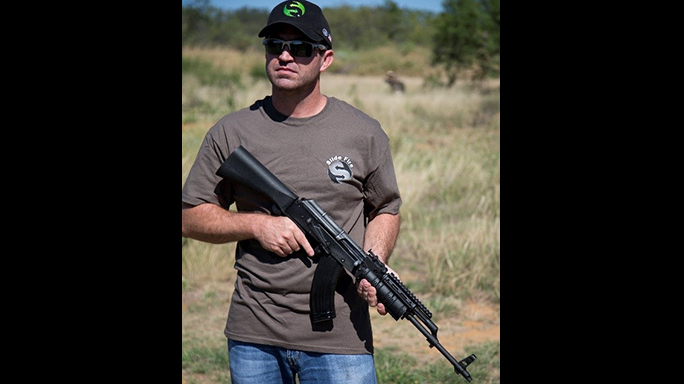 Slide Fire offers bump-fire conversion kits with new stocks, handguards and pistol grips to dramatically increase your AR’s rate of fire. 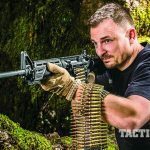 You might just have to get a belt-feed conversion, too! 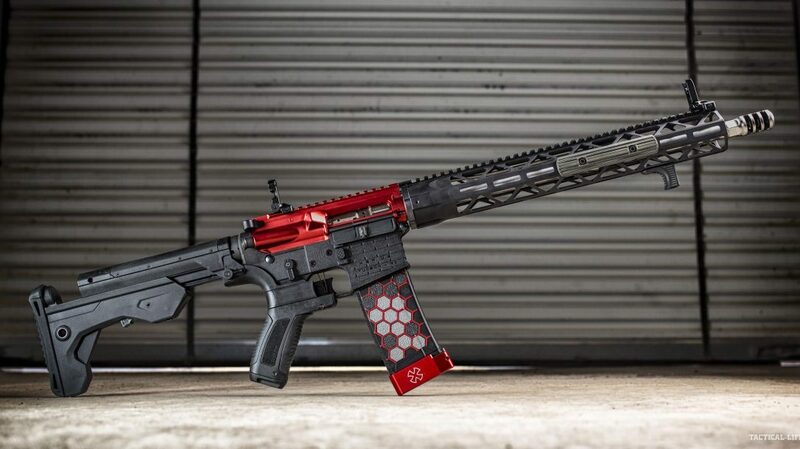 Designed specifically for precision shooters and their top-notch ARs, Slide Fire’s SSAR-15 MOD stock can be adjusted to six different length-of-pull positions and features dual locking mechanisms to eliminate any possible rattle or play for rock-solid stability. 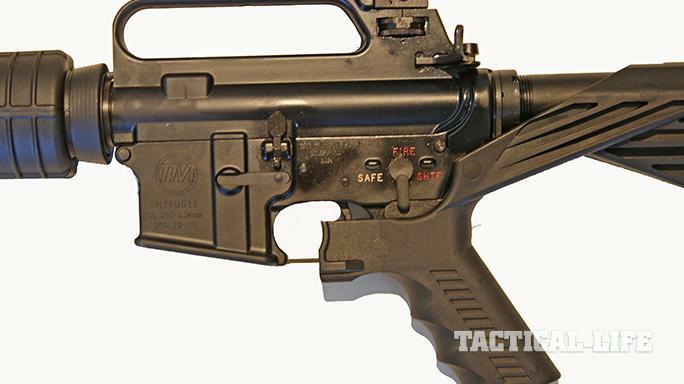 With a Slide Fire stock like the SSAR-15 MOD version (shown) installed, a shooter can turn a lock switch to allow for bump firing. 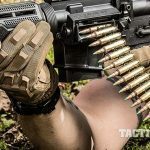 Simply apply forward pressure against the handguard (another Slide Fire upgrade is shown) as you fire and the recoil will trigger the next shot. Users can then switch back to semi-auto fire if so desired. 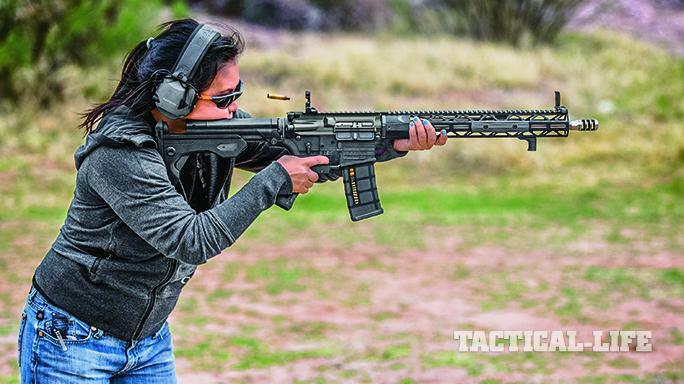 Set in rapid-fire mode, a Slide-Fire-configured AR-15 has the potential to put a lot of lead downrange in a hurry. 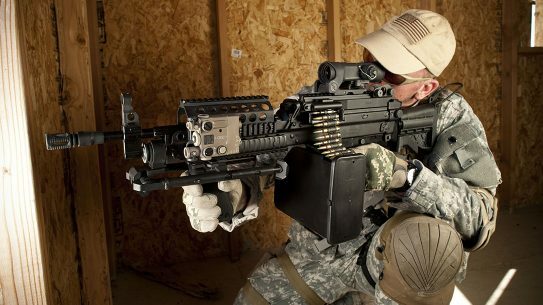 Of course, it might take you a few magazines to get used to the feel of the bump-fire mechanism. 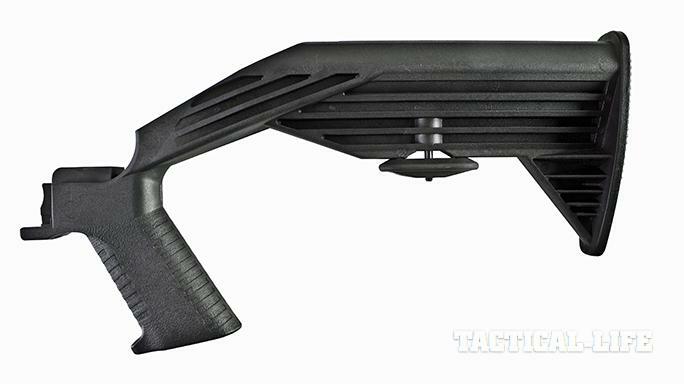 Slide Fire offers a number of stock options, and while the SSAR-15 OGR version can fit on most commercial and mil-spec buffer tubes, the adjustable, higher-end SSAR-15 MOD stock (shown) can only be installed on ARs with mil-spec-sized buffer tubes. 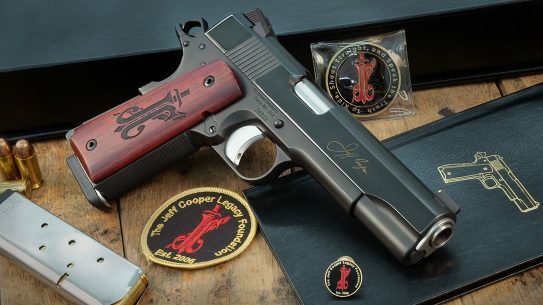 In 1934, Congress passed the National Firearms Act (NFA), which, among other things, placed restrictions on the purchase, sale and ownership of what the federal government calls “Class 3” weapons. This classification included firearms that could operate in a fully automatic mode, or in other words, firearms that could discharge multiple rounds as a result of pulling the trigger only once. 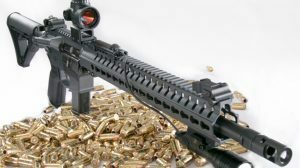 There are appropriations within the NFA to still own fully automatic weapons, but unless you have beaucoup bucks to pay all the taxes and licensing fees, persuade the local police to grant you their blessings, live in what the Bureau of Alcohol, Tobacco, Firearms and Explosives (BAFTE) feels is the right kind of neighborhood, pass all the background checks and then be patient enough to wait for months for a decision from the government, you will likely not be holding a fully automatic rifle any time soon. 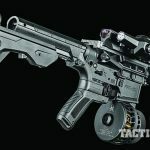 But there is a viable and legal alternative that allows you to mimic a fully automatic weapon and not have to go through all of the legal hoopla and expense associated with obtaining a Class 3 permit. 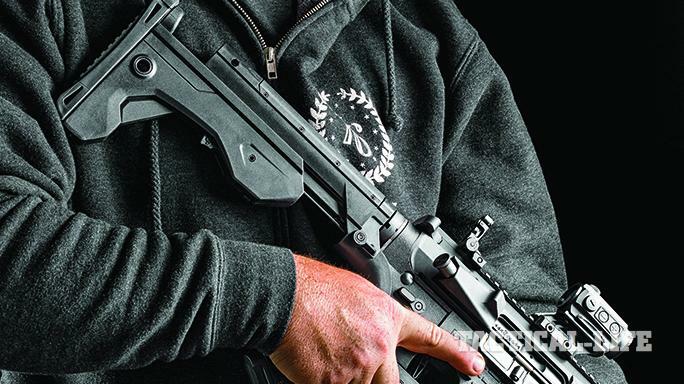 This alternative comes from a company called Slide Fire Solutions and takes the form of a simple-to-install kit that fits most AR-15, AK-47 or Saiga-style rifles. 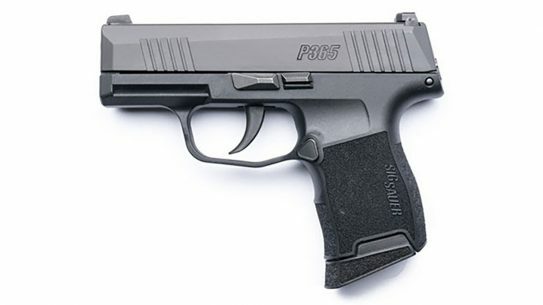 Some people refer to this basic design as a “bump-fire” system whereby the trigger becomes engaged as a direct result of the firing of the rifle and the opening of the action. 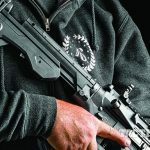 As much as this letter indicated that the design was exempt from the requirements of a Class 3 firearm restrictions, Slide Fire Solutions took this as meaning that the system was legal to produce and distribute. 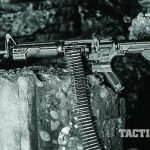 A copy of this letter can be found on the Slide Fire Solutions’ website, and a copy is also included with the purchase of each Slide Fire conversion kit. 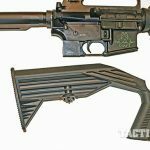 The stock conversion kits vary somewhat depending upon the platform they are to be installed upon, but each kit essentially consists of only two parts: The composite replacement stock and a metal block that attaches behind the trigger assembly of the rifle. 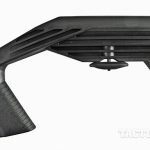 Once the “lock switch” knob on the buttstock has been moved to the automatic setting, as long as the shooter maintains constant forward pressure on the rifle’s forend, the rifle will very closely mirror the actions of a fully automatic firearm. 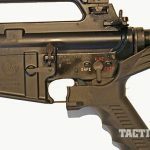 Then, when you wish to return to the usual semi-automatic mode of fire, you simply turn the “lock switch” knob 90 degrees to disengage the bump-fire mechanism. 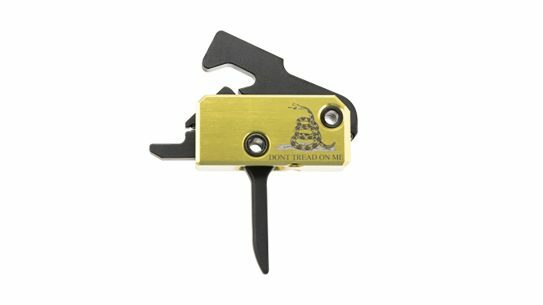 The location of the lock switch will vary somewhat depending upon the rifle style, but it will generally be found somewhere on the underside of the buttstock. 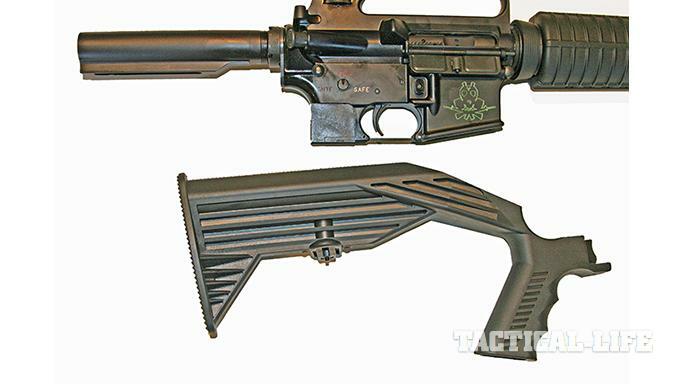 As mentioned, Slide Fire conversion kits are currently available to fit most AR-15, AK-47 and Saiga rifles. They all operate in a similar manner, but the shape and configuration of the stocks will vary somewhat from model to model. 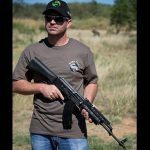 All operate on the bump-fire principle, and when installed, the shooter has the ability to select whether they want to fire in a fully automatic mode or in the usual semi-automatic manner. 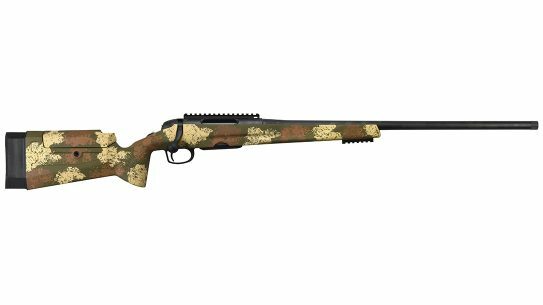 The kit prices vary depending upon the rifle type. 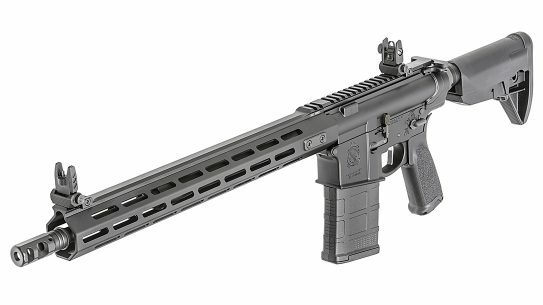 Kits are also available for several .22 LR rifles, including the M&P15-22, which comes with a Recoil Enhancer and a 3.5-pound curved trigger. 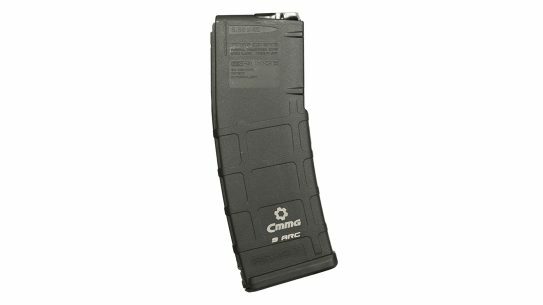 There are also a wide variety of accessories and stocks available through the Slide Fire website, including 50-round drum magazines for both 5.56mm and 300 Blackout cartridges. Great ideas don’t always come from million-dollar labs. Many “Now why didn’t I think of that?” moments occur in garages, backyards and basements. Or, in the case of Jeremiah Cottle, Slide Fire’s creator, it all started on a small farm located in central Texas. Here’s the lowdown on how Slide Fire came to be by way of a recent Q&A session. I grew up on a farm in Moran, Texas, and when I turned 19, I joined the military and served in Bosnia, Kosovo and Operation Enduring Freedom, where I was injured and then retired from the military and returned home. You know, growing up on a farm, out in the country, when something broke down it wasn’t like you could just go to town and buy the parts you needed. My granddad always taught us that to fix something we needed to think outside the box and use our own two hands, so that’s what I’ve always done, and I used this mindset to create Slide Fire. How did you come up with the idea of Slide Fire? I’ve been a recreational shooter my entire life, and I’ve always enjoyed shooting full-auto weapons. 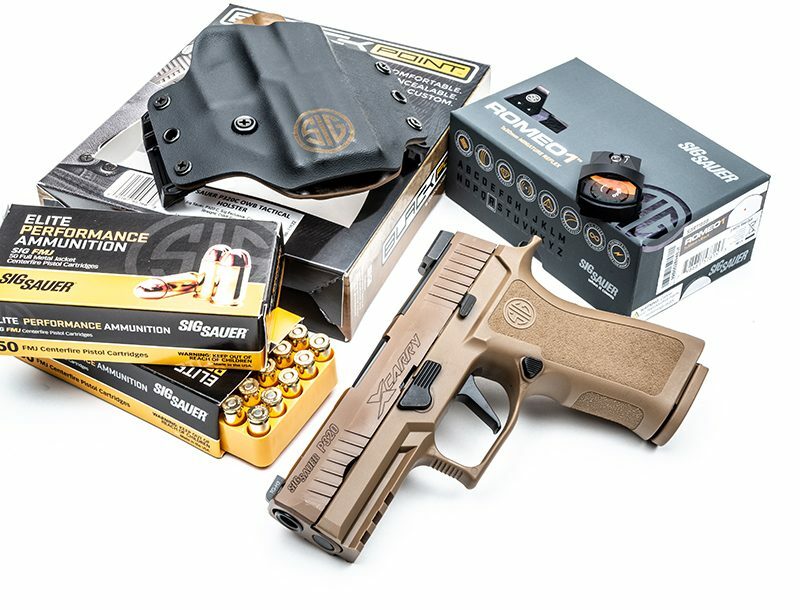 At the same time, purchasing a Class 3 firearm is outrageously expensive, not to mention it requires a mountain of paperwork sure to give you life-threatening paper cuts. I had bump fired in the past, but it was completely uncontrollable, unsafe and unusable. I wanted to find a way to change that, to make bump firing safer and more controlled. 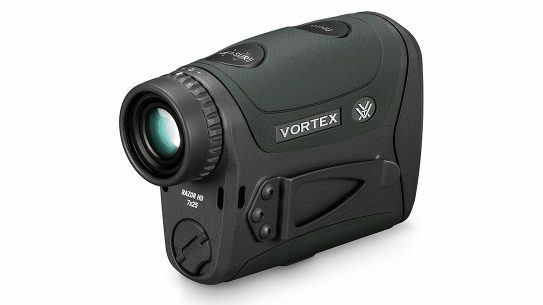 I tried all kinds of things: Harnesses, different bump-firing techniques, but none of it worked, and if they worked they weren’t reliable or consistent. 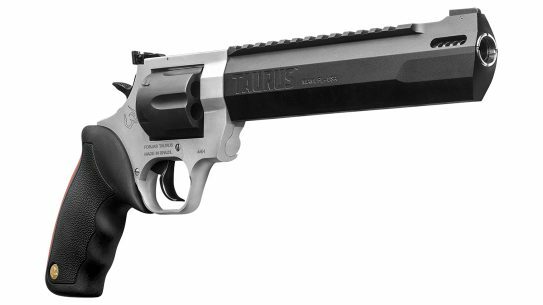 One afternoon it dawned on me that you needed a stable platform to hold onto the firearm, but the firearm still had to be able to move in order to bump fire. I wondered if this could be done by replacing the pistol grip and the stock. So I went out to my woodworking shop and got a 2×10 and PVC pipe and duct tape. It took me an hour to put it all together, it was getting dark. but I had to test it or I wouldn’t be able to sleep. It ripped off the 10-round mag and worked perfectly, but I no longer had a safety since there was no pistol grip. Also there was no lock switch, so the stock would just slide off. Safety issues that needed to be solved aside, I knew what I designed had promise and that I needed to start doing some 3D engineering if I wanted to move forward. But getting a 3D print is expensive, and I was broke. I had to decide if this was just a “Hey, that’s kind of cool” thing or if it was something that really had promise. So, I thought about it, and I prayed about it. Ultimately, I decided to go for it. I used all of my savings from the military, sold everything in my house that wasn’t nailed down and started making 3D-printed models and solving problems. Finally, I sent the stock to the BATFE when I had a design that was close to being commercially ready. I was so happy when I got the word that it was approved. 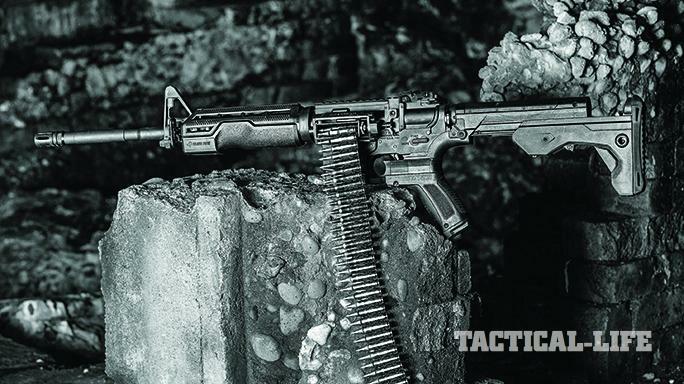 Who is the Slide Fire stock geared toward? Some people like drag racing, some people like skiing and some people, like me, love full-auto. Unfortunately, the average recreational shooter doesn’t have access to a Class 3 firearm of their very own—they’re just expensive and impractical, like buying your own personal golf-cart hovercraft. I mean, if you can afford it, why not? For everyone else, Slide Fire brings shooters the same full-auto experience but without having to take out a second mortgage on their home. Really, all I did was create a way an individual can shoot a firearm differently. I simply changed the way they pull the trigger. 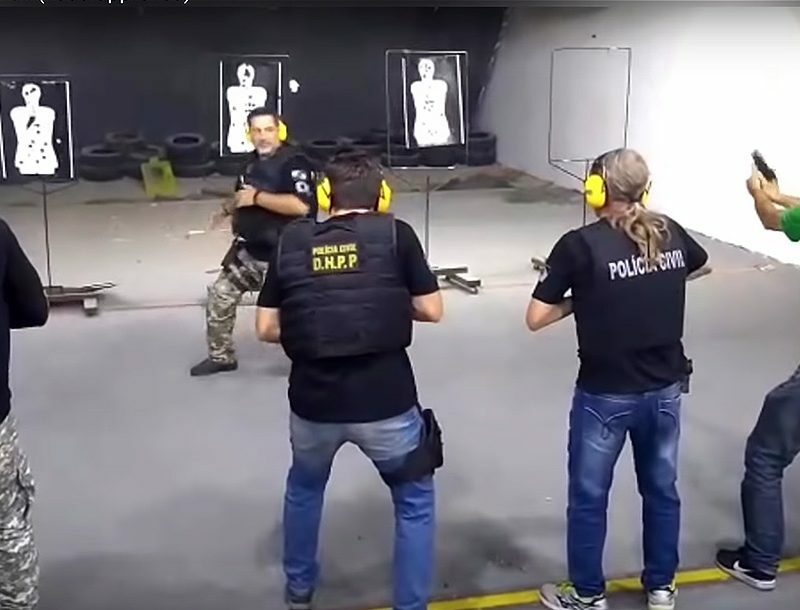 They press the gun into a firing sequence, and the recoil and sliding stock allow them to pull the trigger very rapidly at near full-auto speed. I will say there’s a learning curve to it, and it often takes a couple of magazines for people to figure it out. I always like to tell people it’s like the gas pedal on a car—if you push forward gently, it will go. 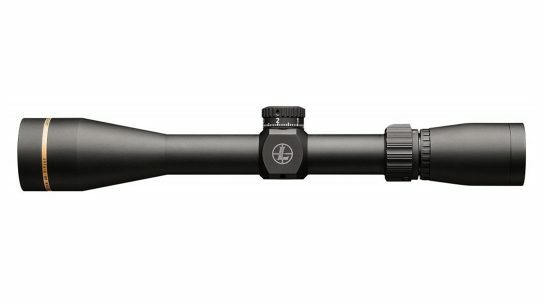 What’s the accuracy and reliability like? It’s extremely accurate compared to a full-auto rifle, and it’s much more controllable. 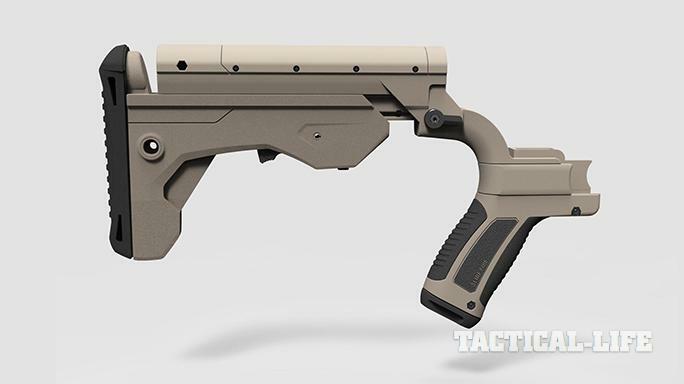 The sliding stock absorbs the recoil, like a shock on a motorcycle, making it easier to aim. As far as reliability goes, it has very few moving parts; there’s really nothing to break on it. The stock’s not going to malfunction, so it’s really just a matter of whether the gun you’re using it on is reliable or not. What sort of quality-control measures do you use? Every Slide Fire stock we send out is test-fitted on a lower to make sure the fit and function are correct. Each one is visually inspected for flaws, and the ones that don’t pass muster are rejected. 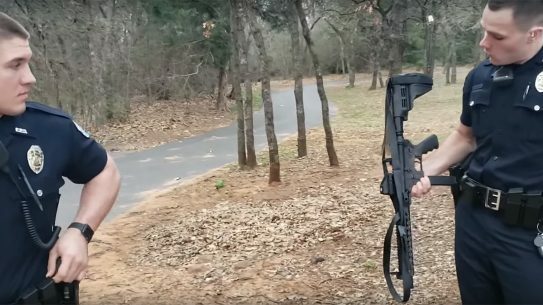 There has been some chatter on the Internet that Slide Fire literally makes a gun an “automatic” and thus should be banned. Your thoughts? I’ve read the articles; they’re completely incorrect. An automatic weapon is one that fires multiple shots with a single pull of the trigger. With Slide Fire, you still have to pull the trigger each time it fires. 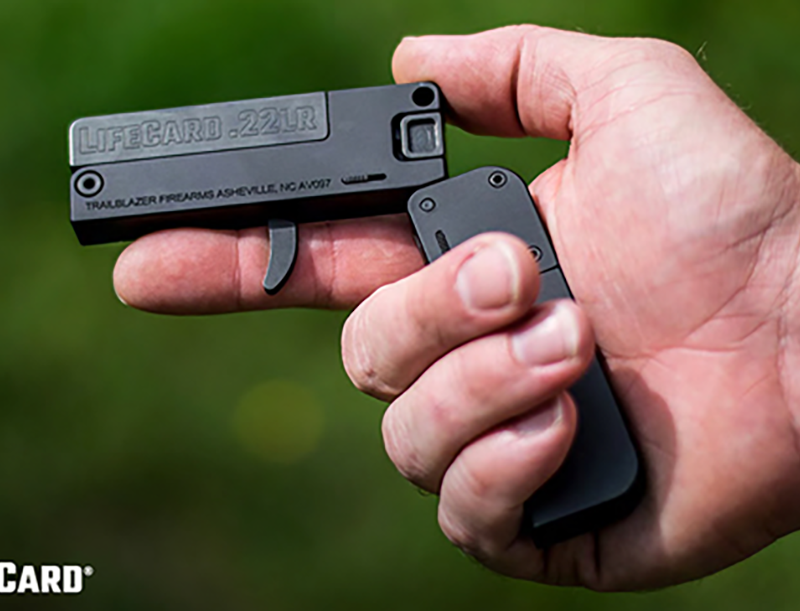 The Slide Fire stock does not change the mechanics of the firearm—it simply enables the shooter to pull the trigger very rapidly. 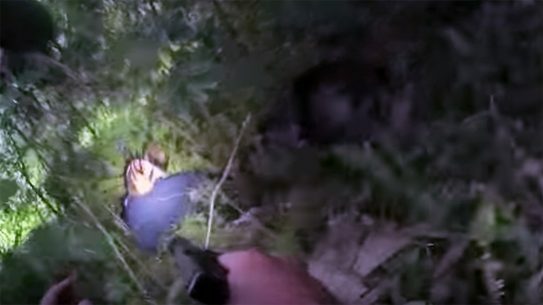 Should we ban Jerry Miculek’s trigger finger because he can fire six shots from a revolver, reload and fire six more shots in less than three seconds? I mean, that works out to around 240 rounds a minute! Can you give us a peek at future product offerings? 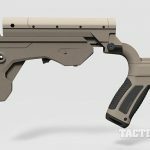 Well, there are two new designs for the AR-15 and the AK-47 that I’m developing; they’re going to bridge the gap between our legacy stocks and our high-end stocks. 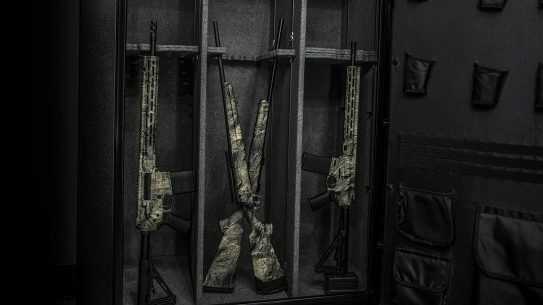 Also, we’ve partnered with a few firearm manufacturers and hopefully this fall we’ll be offering complete rifles. I want people to know this is a veteran-owned company that I built with my own bare hands. This wasn’t built by investment firms. This was built by me. I had a dream, and I made it happen. I say that to encourage others. If you have an idea, chase it. You don’t want to be 75 years old and think, “What if I had actually done that?” You won’t know if you could have succeeded unless you try. For more information, please visit SlideFire.com. 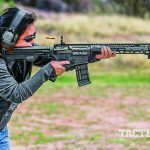 This article was originally published in ‘AR Rifleman’ 2017. To pick up a copy, visit outdoorgroupstore.com.